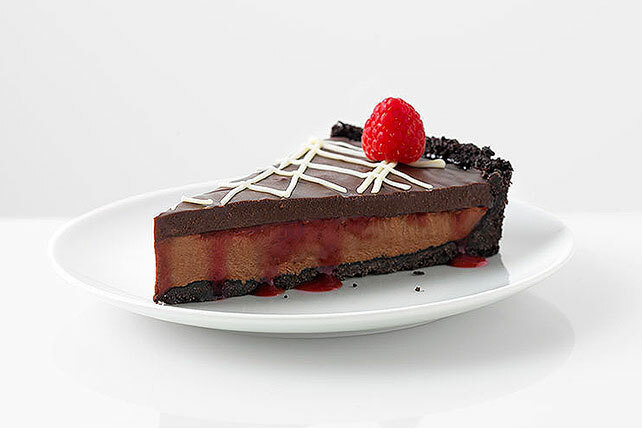 Satisfy your sweet tooth with this Chocolate and Raspberry Tart. You'll impress guests with this Chocolate and Raspberry Tart's flavors and looks alike. Spray 10-inch tart pan with removable bottom with cooking spray. Combine cookie crumbs and butter; press onto bottom and up side of prepared pan. Refrigerate until ready to use. Melt 2 oz. semi-sweet chocolate as directed on package. Beat pudding mix and milk in medium bowl with whisk 2 min. (Pudding will be thick.) Stir in melted chocolate, then 1 cup COOL WHIP until blended. Pour into crust. Refrigerate 1-1/2 hours. Microwave remaining semi-sweet chocolate and COOL WHIP in microwaveable bowl on HIGH 2 min., stirring after 2 min. Stir until chocolate is completely melted and mixture is well blended. Cool 10 min. Microwave jam in separate microwaveable bowl on HIGH 15 sec. ; spread over pudding layer in crust. Cover with COOL WHIP mixture. Refrigerate 30 min. Run knife around tart to loosen from rim of pan; remove rim. Melt white chocolate as directed on package; drizzle over tart. Garnish with berries. A slice of this delicious tart goes a long way on chocolate flavor. Prepare using seedless strawberry jam, and substituting 6 halved fresh strawberries for the raspberries. If you don't have a tart pan, use a plastic wrap-lined 9-inch round pan instead. Prepare tart as directed. Use plastic wrap handles to remove tart from pan before cutting to serve.